The penultimate race of the Formula One season takes place this weekend and F1 betting fans couldn't be more ready. The drivers’ championship may be over but there's still plenty of interest in the Brazilian Grand Prix, and time to place your bets. Will Lewis Hamilton win it for the second year in a row? Will Max Verstappen continue his good form? Or could there even be a fairy tale win for Felipe Massa in his final home Grand Prix? 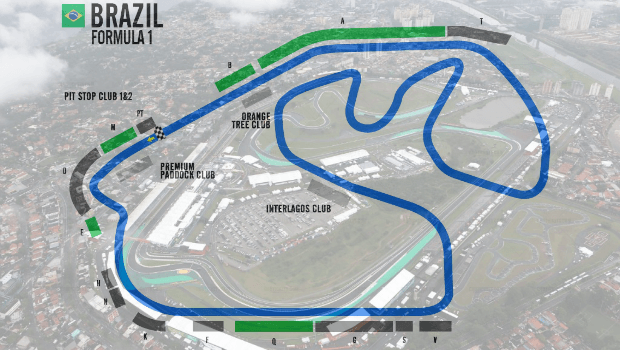 Get all the latest odds and more in our Brazilian Grand Prix betting preview. Britain’s Lewis Hamilton secured his fourth world title at the Mexican Grand Prix two weeks ago despite only finishing ninth. It made him the country’s most successful F1 driver and only the fifth driver in the history of the sport to win four or more world titles. The 32-year-old, whose tax affairs have been in the news this week, could be forgiven for taking his foot off the gas at Autódromo José Carlos Pace. But Hamilton has his eyes on yet another record. If he wins this weekend, he'll become the first driver ever to win 10 or more races in four seasons, having done so in each of the last three years. Hamilton recorded his first win in Brazil last year following second-placed finishes in 2014 and 2015, and is naturally the firm favourite to take the chequered flag this time around. Punters looking to back Hamilton will struggle to find value with the Mercedes driver on most F1 betting sites, but you can get odds of 5/4 over at Betfair. The Brit is also odds-on to finish in pole position having broken the F1 record for most pole positions earlier in the season. William Hill is offering odds of 4/5 which are currently the best odds available on him to be at the front of the grid once again. With this year’s champion already crowned, thoughts are turning to next season and one man who looks set to challenge Hamilton is Max Verstappen. After becoming the youngest-ever winner of a Grand Prix in the 2016 season, the 20-year-old has won two of the last four races. He’ll want to continue his strong end to this season and send out a message to Hamilton that he’s ready to be a serious challenger next year. The Dutch driver looks good value at 41/10 with 10Bet to make it three wins in five races. He finished third at Interlagos in 2016 and is 1/2 odds to get on the podium again. Punters should also keep an eye on the weather when planning their betting strategy for this weekend’s race as this can effect the drivers' performances. Verstappen for example has impressed in wet conditions, not least at this race last year. The bookies seem to think that first place will be going to Hamilton, Verstappen or Ferrari’s Sebastian Vettel, who is 10/3 with 10bet despite only recording one podium finish in the last five races. However, those who fancy a longer shot should consider Verstappen’s Red Bull teammate Daniel Ricciardo. The Australian has retired in the last two races, but whenever he has finished this season it’s normally been in the top three. In 13 completed races, he’s managed nine podium finishes and is 11/10 with Unibet to notch another one, while Paddy Power are offering tempting odds of 9/1 on him to win his second race of the season. Red Bull dominated this circuit from 2009 to 2013 and will want to regain that dominance while showing they can be the main competitors for Mercedes next season. They are 2/1 with several online betting sites to be the winning team on Sunday. Felipe Massa announced last weekend that he’ll retire at the end of the season, meaning this will be the Brazilian’s penultimate race and final home grand prix. Romantics may be hoping that Massa can add one more to his 11 grand prix victories. However, realists will look at his record this season and see that he hasn’t managed a single podium finish. In fact, Massa hasn’t won a race since the Brazilian Grand Prix in 2008, although he did finish third at Interlagos in 2014. The 36 year-old is 1500/1 with 888 Sport and beyond the six main contenders, he is probably the most appealing of the rest, most of whom are similarly priced. For a full list of F1 odds and markets, head over to 888 Sport to get your bets in for this weekend’s race.